This January at the Consumer Electronics Show (CES) in Las Vegas, visitors were able to see the latest technologies including the futuristic Picture-on-Wall design seen in LG’s 2017 flagship OLED TV – the LG Signature OLED TV W (model W7). Unlike other TV models, the LG Signature OLED TV W does not try to hide a clutter of wires and cables behind the exhibition booth’s walls. Instead, the LG Signature OLED TV W’s screen is separated from its electronic components, while the innovative W-Station integrates all the necessary electronics for sound and the operating system. As a result, this design makes it appear as though the W7is a window into another dimension with its highly crisp image rendering capabilities. Some reporters even tugged on the screen to see for themselves if there were any hidden circuits behind the wall. This groundbreaking design was made possible thanks to some major innovations in television technology such as the versatile W-Station and an all-in-one ribbon cable which links the screen and the W-Station. Equipped with these new technologies, the LG Signature OLED TV W looks as though it is levitating in mid-air, adding to the sense of immersion. 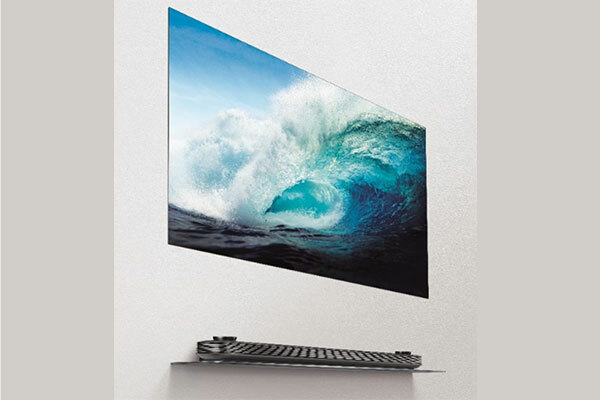 LG’s design goal has been to eliminate every possible distraction from its display, in order to create a TV that delivers the ultimate viewing experience to consumers. The company’s ideal future TV design is defined as a TV that only has a display, without bezels or a hefty circuit box at the back of the screen, while sound emanates from a miniscule yet powerful speaker system. This overarching design concept has finally led to the futuristic “Picture-on-Wall” design of the LG Signature OLED TV W.
In designing the LG Signature OLED TV W, LG started with a TV that featured a screen, a speaker system and a separate circuit box that resembled an external set top box. After various design simulations, this eventually evolved into the current system with a screen and the W-Station. This design concept was seen as the best option for offering users an immersive viewing experience while emphasizing both essential media elements– visual and audio. As a result of the separation design concept, the wall-mounted LG Signature OLED TV W measures in at only 3.85mm in depth for the 65-inch model – roughly the same width as three stacked credit cards, while they are placed flush against the wall. While measurements of other TVs specify where to find “the thinnest part of the screen”, LG Signature OLED TV W has made this term unnecessary with its unique design solution found in the W-Station. The W-Station houses a number of vital electronic components and empties the back space of the screen, helping the TV seamlessly sit flat on the wall. With this circuitry-free display, the W7 adds a minimalistic flair a living room, accentuating all the other aesthetics of the interior décor. Capable of delivering immersive Dolby Atmos sound, LG Signature OLED TV W’s W-Station also helps put viewers inside the action with rich sound that fills the entire room. Even the space overhead is bathed in powerful, moving audio that flows seamlessly around the audience. Dolby achieves this degree of precision by isolating the relative location of each sound to create incredibly intricate audio that is as rich and multi-layered as the real world. In addition, the W-Station is home to all the ports needed for your ultimate home entertainment system. The LG Signature OLED TV W also implements new technology in its connection cable. This extremely thin cable transmits a range of signals from various ports to connect the LG Signature OLED TV W to external devices, smart TV inputs, broadcast and audio signals, and even the screen’s power source. During the design process, LG engineers strove to find the best cable material and considered every aspect including its appearance and versatility. LG designers and engineers worked hand-in-hand, day and night, to make the final decision for the ribbon cable’s final material. One of the most difficult things when making a new TV is laying the groundwork for an entirely new structural configuration. For example, every time the TV became 1mm thinner, the display configuration had to be re-arranged from scratch in order to deal with the decrease in allotted space. This meant that in order to create the thinnest TV yet, designers had to be on the same page with circuitry engineers and the manufacturing team at every step of the design process.